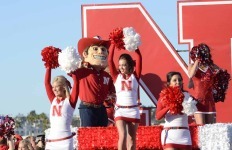 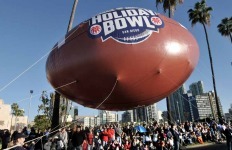 National University Holiday Bowl football promoted Saturday’s game between USC and Nebraska. 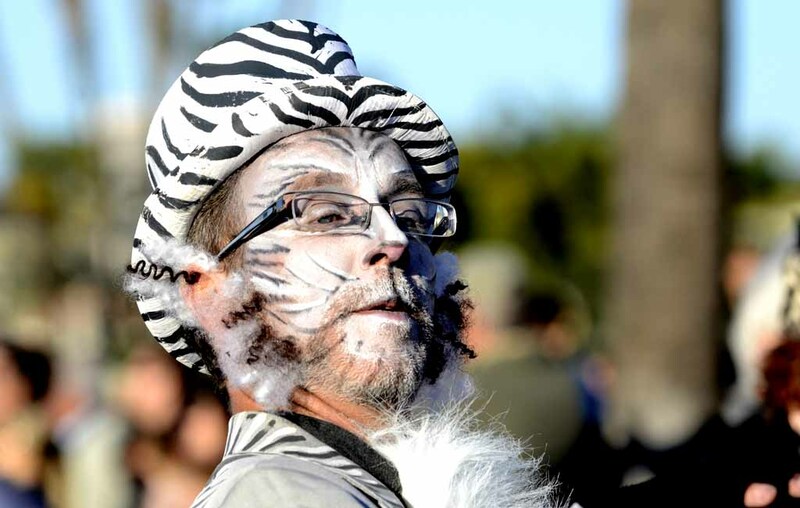 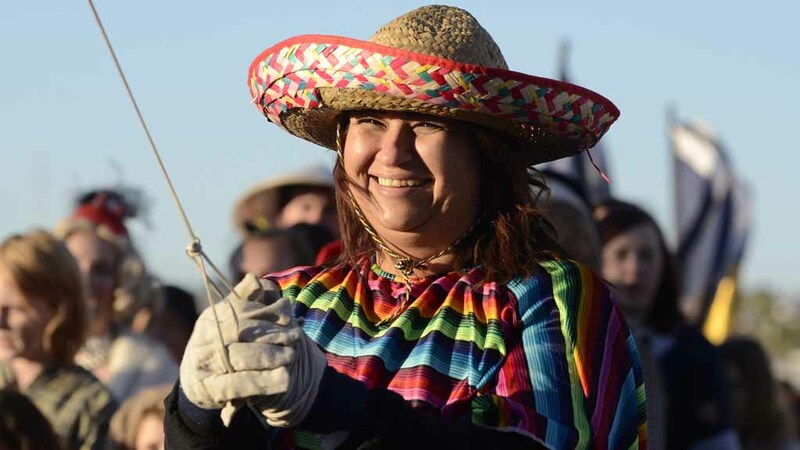 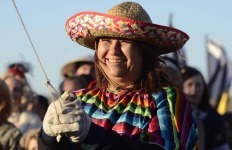 Spotlight Dance member in Big Bay Balloon Parade that proceeded south on Harbor Drive. A balloon holder for the pinata sponsored by Jerome’s Furniture. 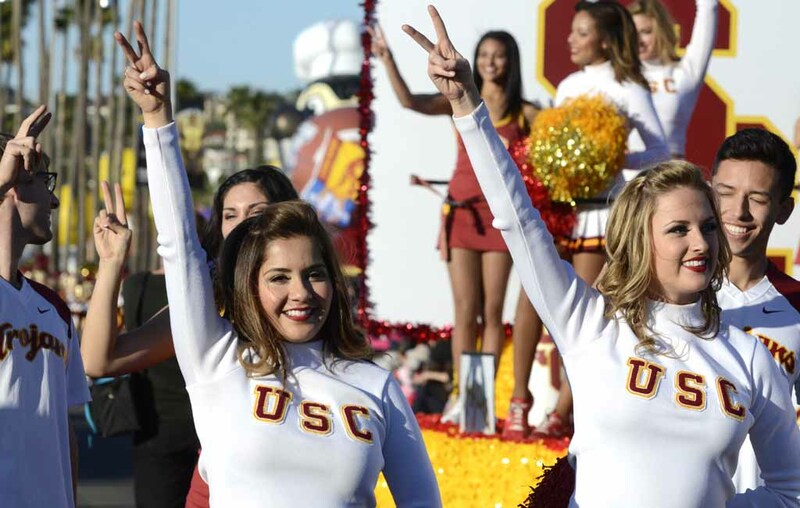 USC cheerleaders paved the way for the Trojan Marching Band. 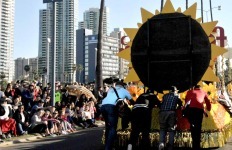 The parade attracted tens of thousands of spectators. 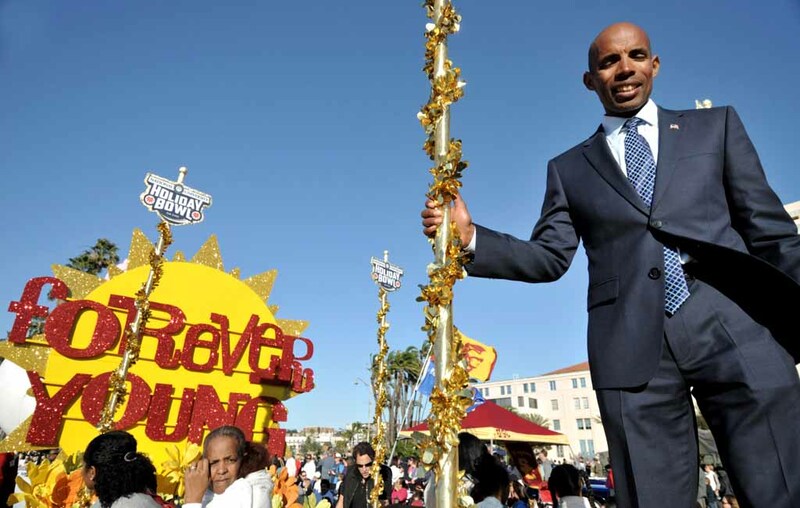 2014 Boston Marathon winner Meb Keflezighi was grand marshal for Friday’s Big Bay Balloon Parade. 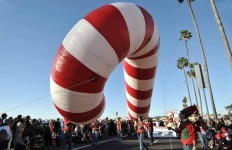 Winds made controlling the balloons difficult. 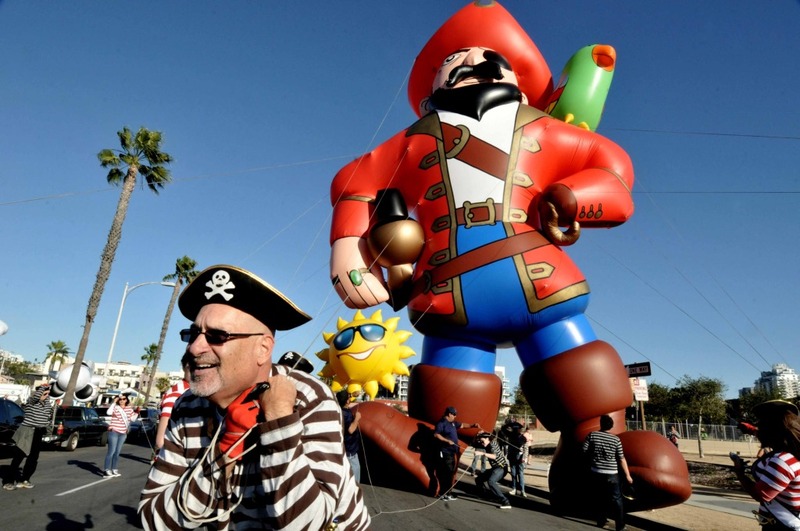 A man pulls Polly and the Pirate, presented by the Port of San Diego. 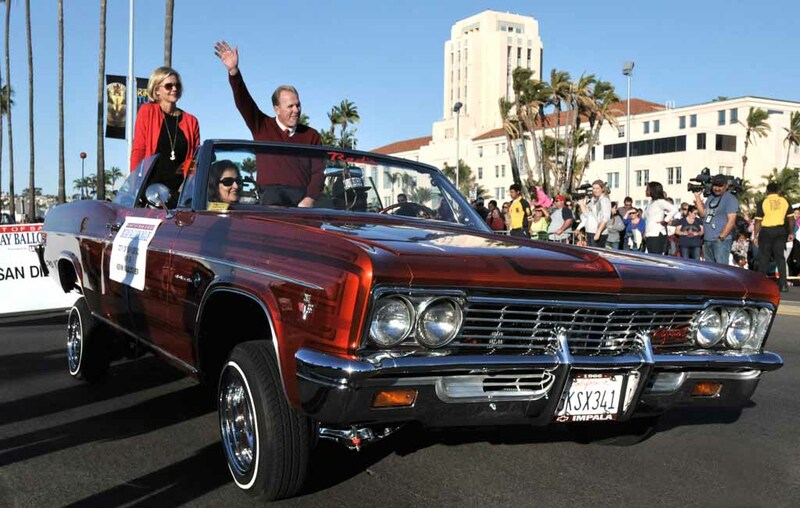 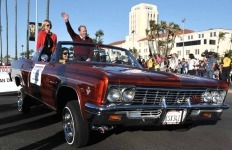 San Diego Mayor Kevin Faulconer and his wife take a cool (buy bumpy) trip in a lowrider. 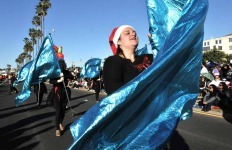 Nine bands entertained the crowd with holiday and school music. 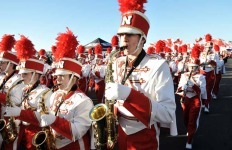 University of Nebraska band played its school song. 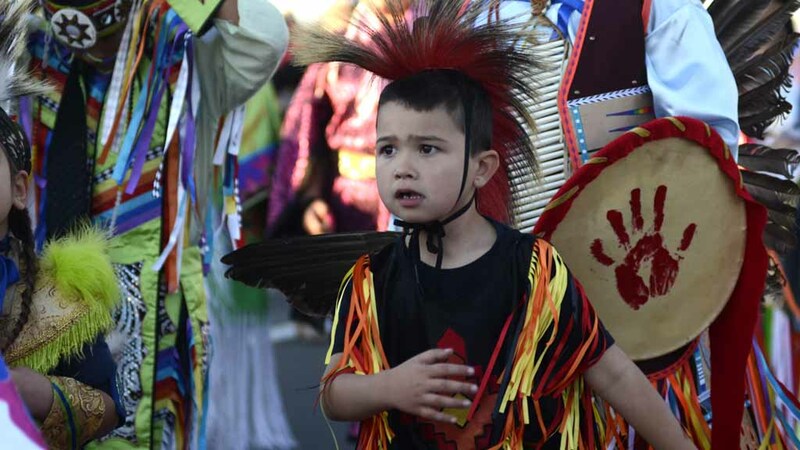 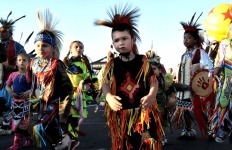 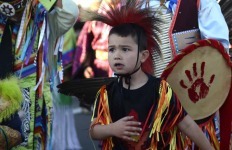 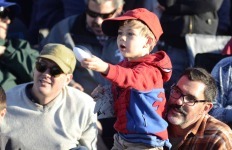 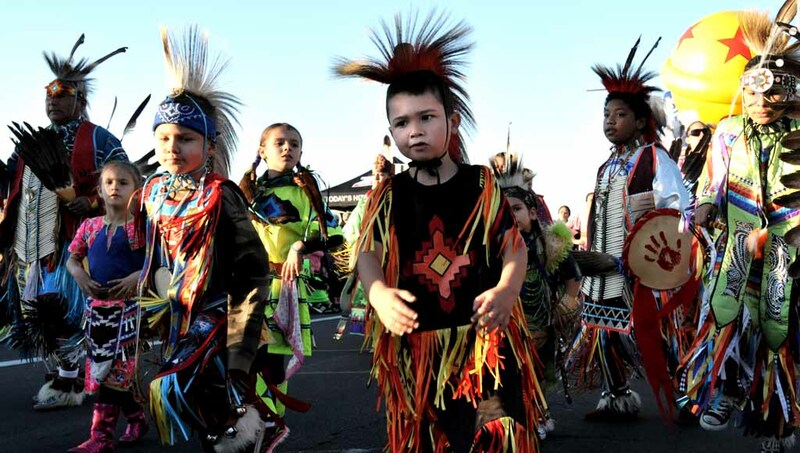 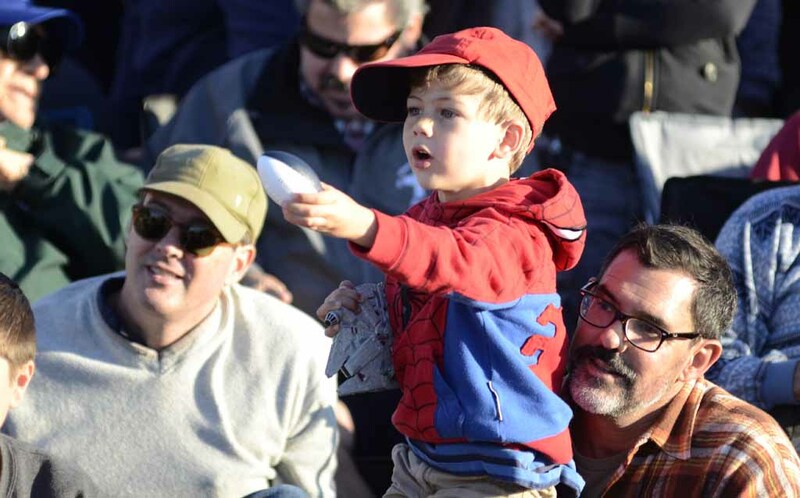 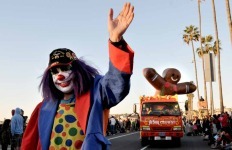 Many children lined Harbor Drive with their relatives to enjoy the balloons, floats and bands. 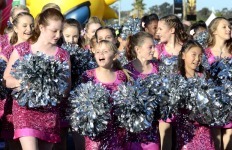 Soaring Eagles dance unit was sponsored by Woodstock’s Pizza. 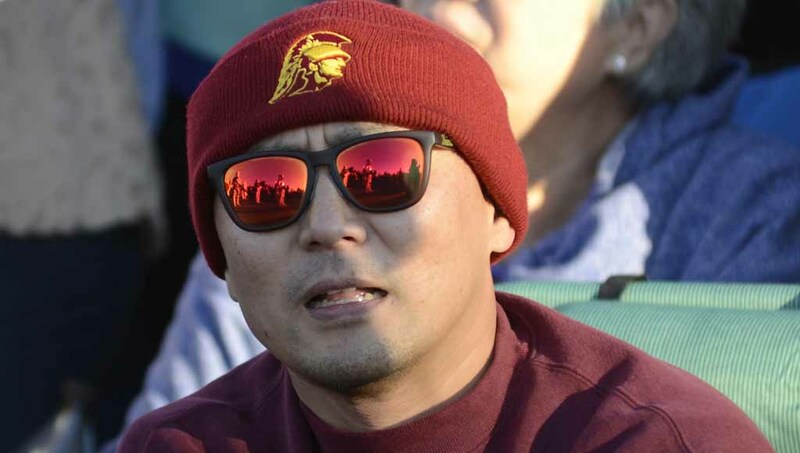 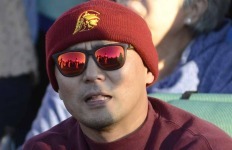 Stormtroopers of the San Diego Star Wars Society were reflected in a USC fan’s sunglasses. 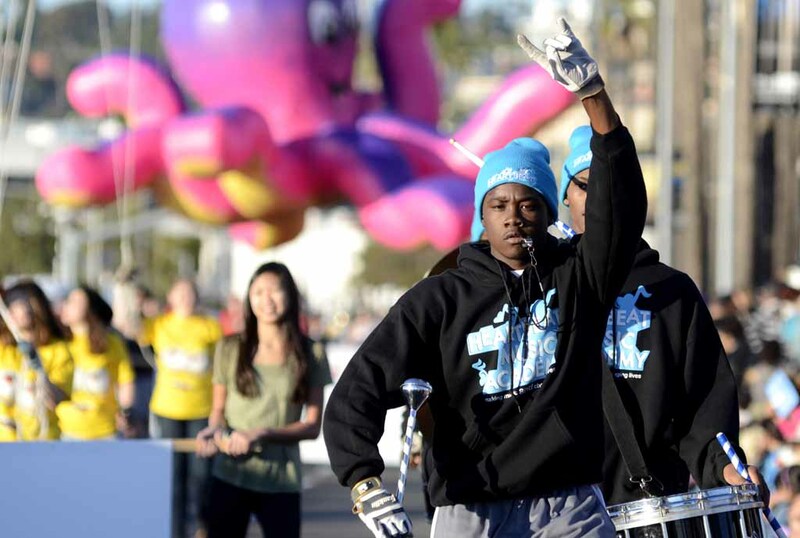 Members of the Heartbeat Music Academy played drums. 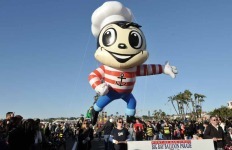 Horatio the Bee, sponsored by Bumble Bee Seafoods, towered over the crowd. 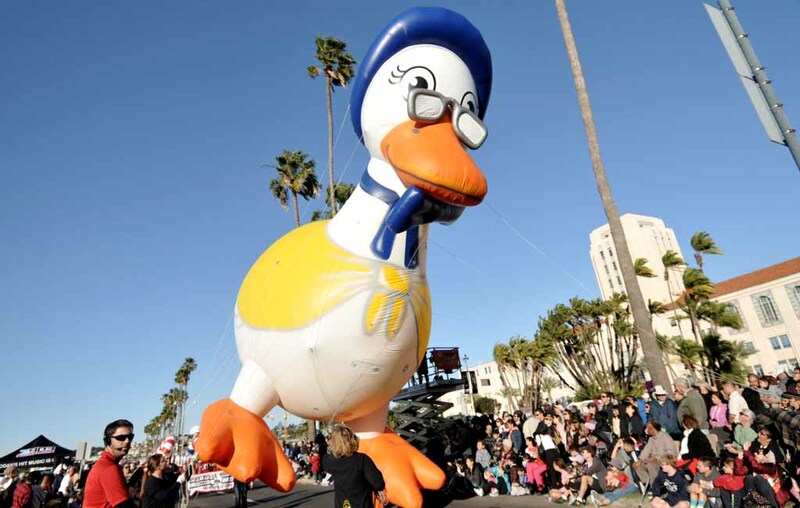 Mother Goose, sponsored by U.S. Bank, also stars in the Mother Goose Parade in El Cajon. 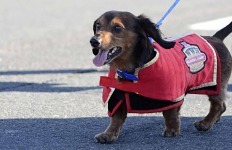 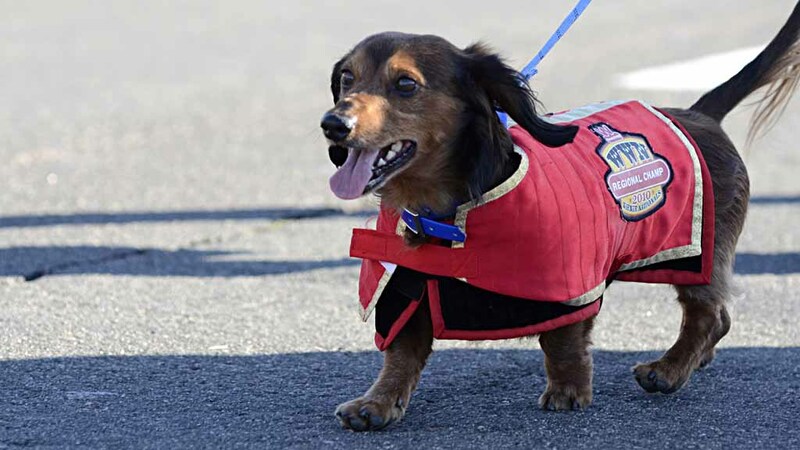 Regional champion of the Weiner National Championships sponsored by Weinerschnitzel marched with other dachshunds. 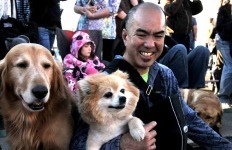 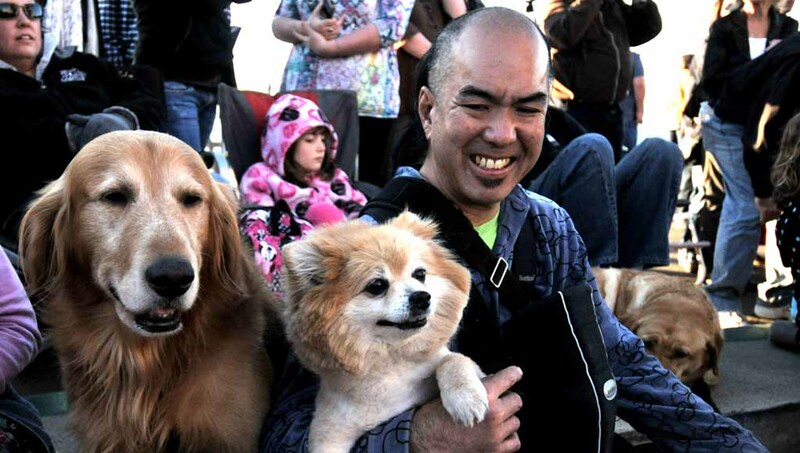 Dogs enjoyed the parade as well as their masters. 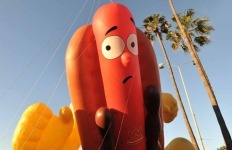 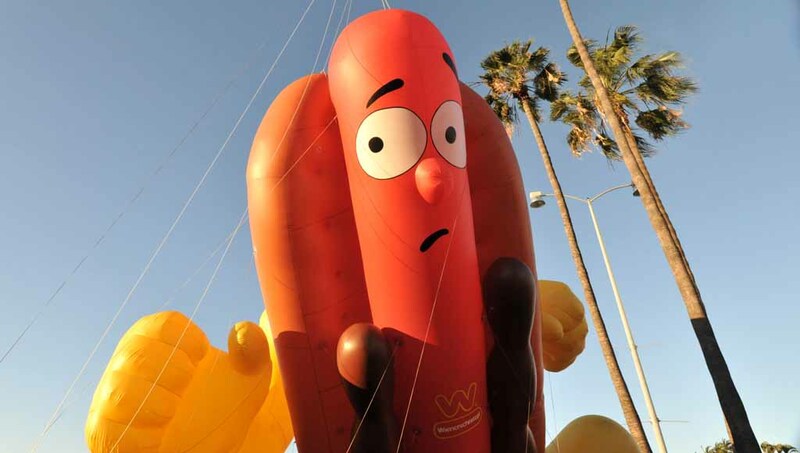 The Delicious One, sponsored by Weinerschnitzel, brought up the rear of the 90-minute parade. 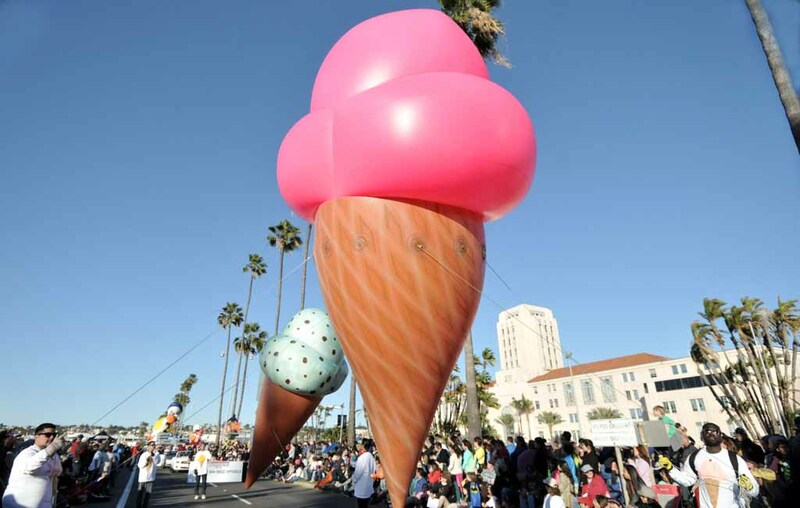 Tasty Treat, sponsored by U.S. Bank, included three cones, which were dipped toward the crowds to their squealing delight. 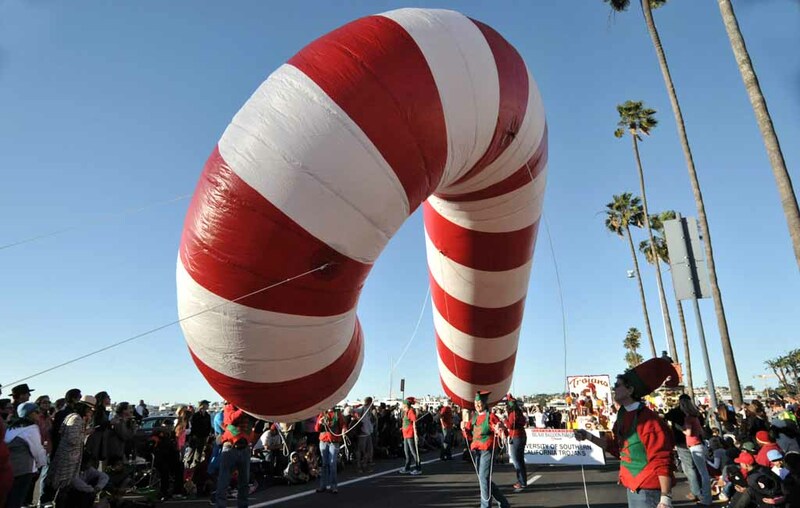 Candy Cane, sponsored by National University, schooled other floats in its handling. 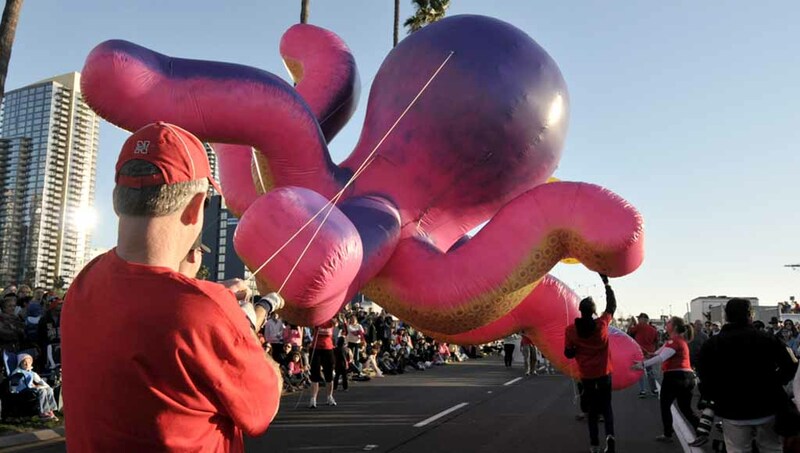 Beckett the Octopus, sponsored by San Diego Family Magazine, was popular with the kids. 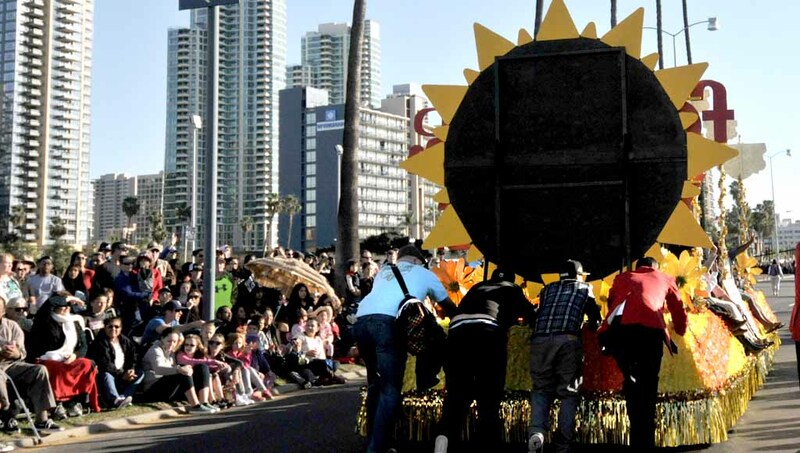 Al Bahr Shrine Tin Lizzies, sponsored by U-T San Diego, made their way down Harbor Drive. 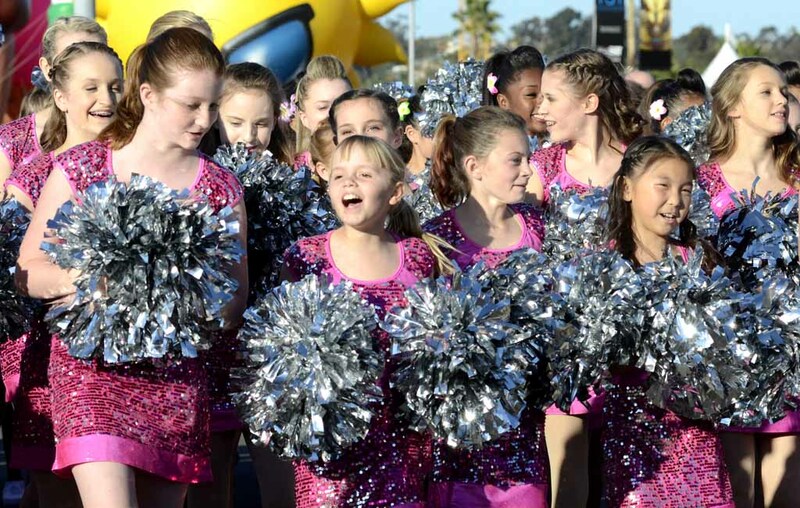 A cheerleader group took part in the Big Bay Balloon Parade. 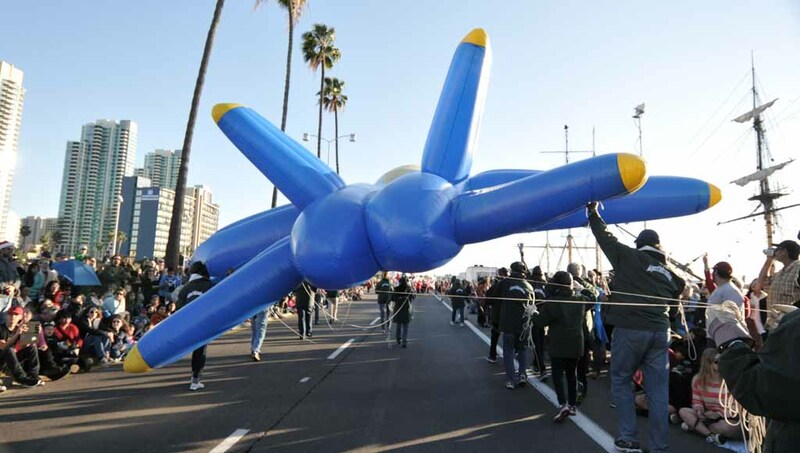 Blue Angels Jet float was sponsored by the San Diego County Regional Airport Authority. 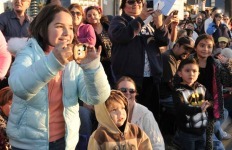 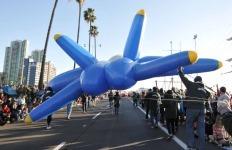 Some 30 giant inflatables towered over tens of thousands of visitors Friday who attended the 24th annual Port of San Diego Big Bay Balloon Parade along the downtown waterfront. 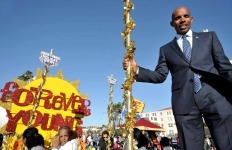 Meb Keflezighi, the San Diegan who won this year’s Boston Marathon and ran for USC rival UCLA, was grand marshal of the parade themed “Forever Young.” His motorized float broke down, and had to be pushed down the route. 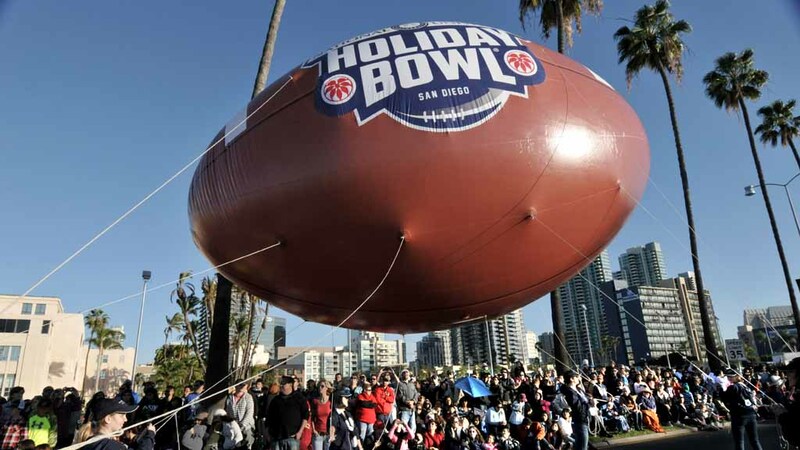 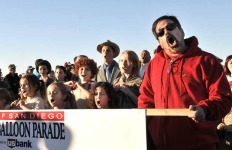 The 90-minute parade was a prelude to Saturday’s 2014 National University Holiday Bowl game between the USC Trojans and the University of Nebraska Cornhuskers at Qualcomm Stadium. 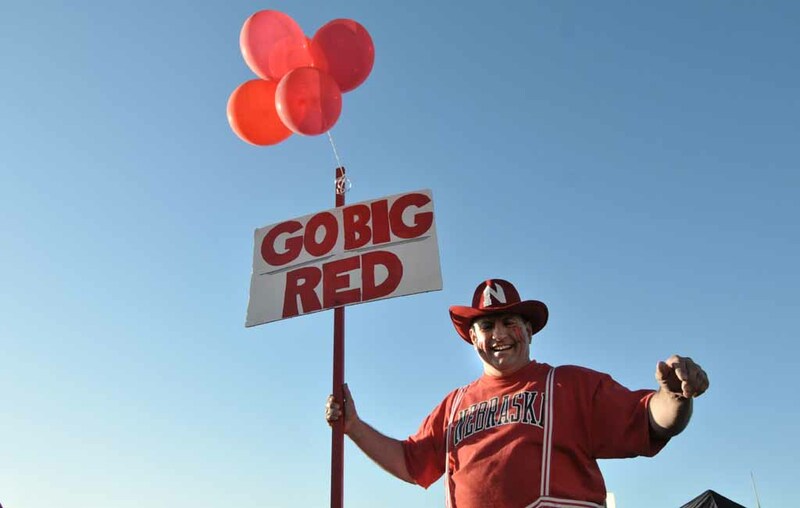 Game time is 5 p.m. 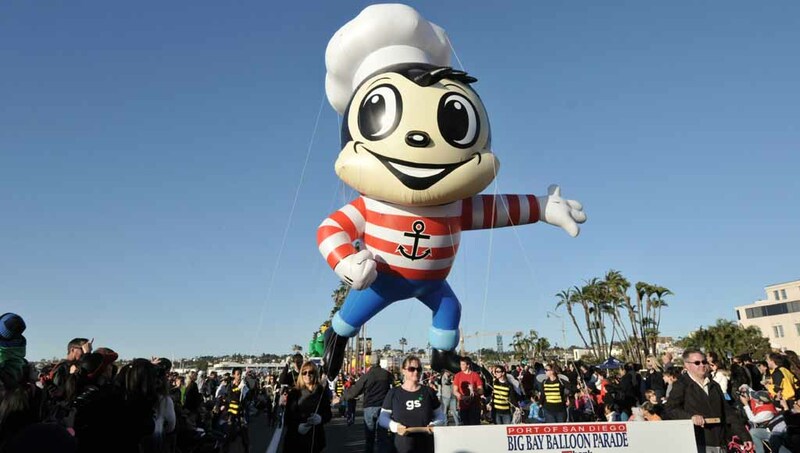 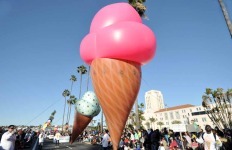 Sponsored by the Port of San Diego, the event was billed as “America’s Largest Balloon Parade” because of the number of giant inflatables. The parade included nine bands, including the Trojan and Cornhusker marching bands, seven floats and several specialty units. 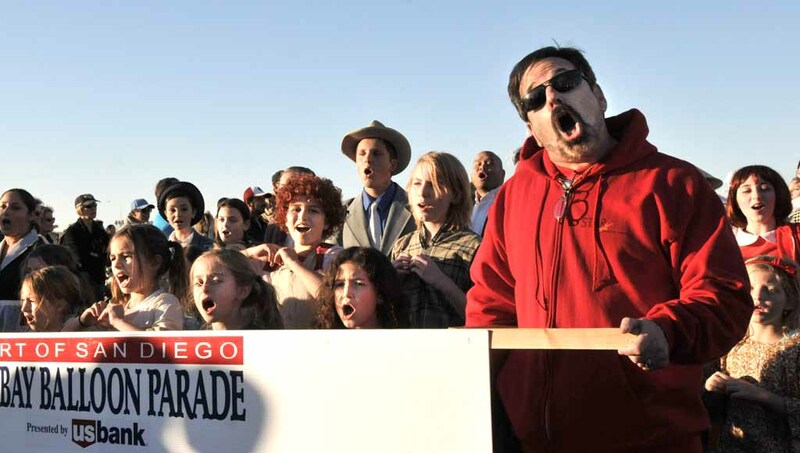 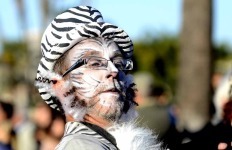 The parade ran south along Harbor Drive from the County Administration Building to the corner of Harbor Drive and Pacific Highway, near Seaport Village. 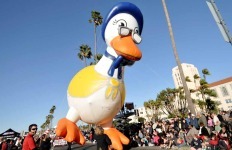 Segments of Harbor Drive and Pacific Highway were closed for the parade starting at 12:45 p.m., and were reopened following its conclusion. 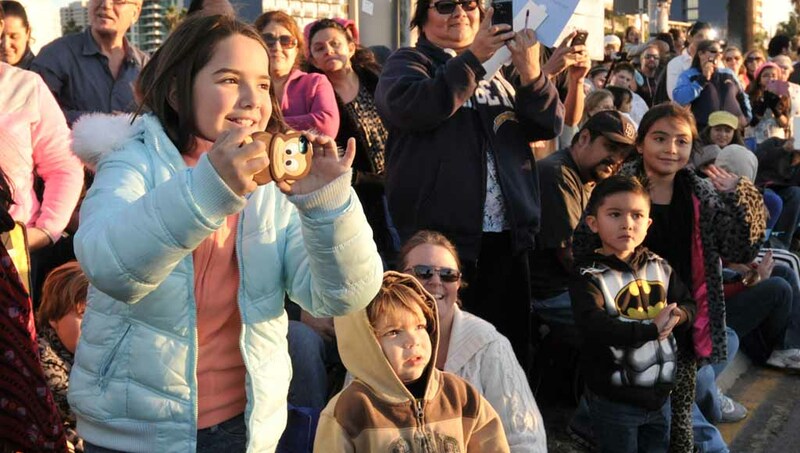 Many parade-goers watched the festivities from Waterfront Park at the County Administration Center, one of the best places to glimpse the procession of balloons.